In August of 1969, when I was fifteen years old, I travelled with my parents from our home in Iowa to New Orleans, Louisiana. More accurately, we tried to travel to New Orleans as we did not make it all the way. By the time we reached the Lake Ponchartain Causeway, we discovered that a major hurricane was bearing down on the Gulf Coast, forcing us to turn back north. We retreated to Natchez, Mississippi to wait out the storm. The storm was Hurricane Camille. Hurricane Camille still holds the record of being the second deadliest hurricane to hit U.S. shores, with the Labor Day Hurricane of 1935 (no names back then), being the first. Officially, Hurricane Camille is still the only Atlantic storm to exhibit recorded winds in excess of 190 miles per hour. After she made landfall at Pass Christian, Mississippi, Camille went on to claim 259 lives before she made her exit back into the Atlantic near Norfolk, Virginia. Camille left behind $1.5 billion in damage (that is $9 billion in today’s dollars), and the devastation to the Gulf Coast was compared to the aftermath of a nuclear attack. This was my introduction to hurricanes. In the Midwest, we didn’t have such storms. We knew about them of course, but in a day when all 3 available television stations were usually off the air shortly after midnight, they were not the focus of much local air time. We were more accustomed to funnel clouds that drop out of the sky to do random damage for a few minutes before disappearing. Tornadoes were sporadic and hard to predict, especially back then, and you usually didn’t know one was coming until you were in one. Similarly, in my part of the country we usually saw hurricanes on the evening news after the damage was done, in spite of the fact they were known to be on the way for days before landfall. As I followed Isaac this past weekend, as it made its way up from the Caribbean, and across the Florida Keys, I thought of how things have changed. Now we have 24/7 news and weather. In addition to the Weather Channel (probably my favorite channel on the box), local news here in the Fort Lauderdale, Miami area was focused entirely on this storm. Newscasters were positioned in all corners of the state, from Key West, to Ft. Myers, Tampa, and further up the coast in Ft. Walton Beach. Still others were headed to New Orleans, now projected to be in the center of the Isaac’s path. All eyes and all news were on the approaching storm, and of course: The Cone. The Cone is sometimes jokingly referred to as the ‘Cone of Death’. Sometimes it is called that and it’s no joke. The Cone is the cone-like projection of the storm’s projected path as it is plotted by weather forecasters on the tracking map. If you are anywhere inside of The Cone, you have some probability of impact. We can even get the ‘cone to our phone’ now, an app that you can sign up for so you can track the cone right from your cell phone. They didn’t have that back in 1969. So one has to wonder if all this fuss is necessary, and several people I have talked to say the hype is too much, and sometimes, I think that as well. 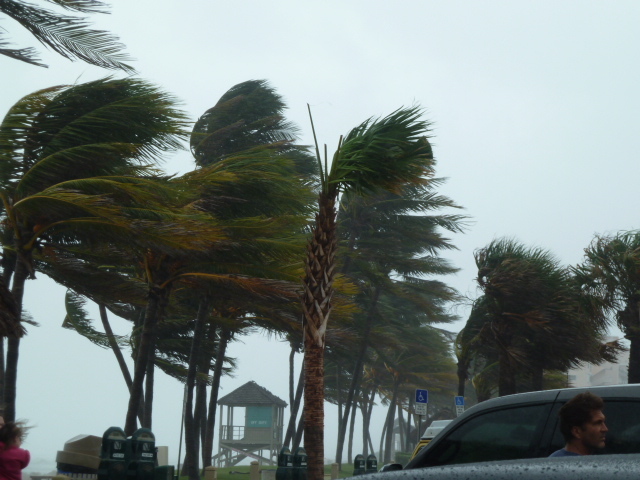 By late day on Saturday, The Cone had shifted to the west and there was little danger of any significant damage along the east coast of Florida. Still the reporting continued, warning us to be aware of the dangers of flash flooding and tropical storm force winds. Are we over-reported today? Maybe not. If over reporting of Hurricane Camille would have resulted in the deaths of 258 people instead of 259 it would have been well worth it. Today, as Isaac approaches New Orleans, ironically cancelling Hurricane Katrina memorial services, my thoughts turn to the citizenry of that city and surrounding environs. Hopefully, this storm will pass without claiming any lives. Can there be any real over-reporting of such approaching storms? Not if you are anywhere near The Cone.